I am sure you are all aware of the problems being faced by many farmers on the Somerset levels cause by the ongoing floods in that area. 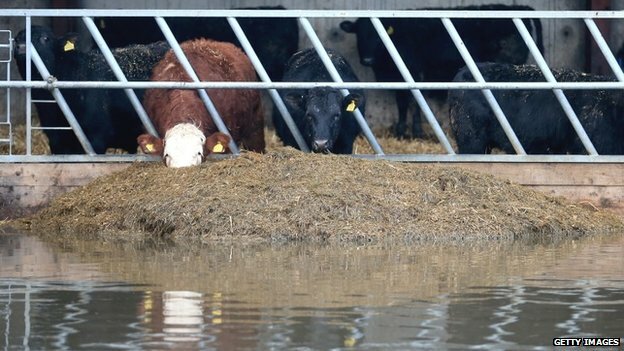 They have lost animals, crops, property and access to the outside world, in some cases whole farms have been swallowed up by the rising water. Last week Essex YFC decided on an initiative which had farms in their county donate any hay or straw that they could spare to the areas affected by unprecedented rain fall. This week Bedfordshire are joining the campaign. We are asking farmers and companies in this region to donate anything they possible can to these devastated areas so that they can feed their animals and keep the farms going. If you are able to donate then please contact Alice Cook on: 07890 451469 or Chris Hunt on: 07721 717655, the collection point for donations will be Watergate Farm, Hockliffe. Tesco have stepped in and are managing the transport so that the supplies can get to where they are needed. If you are unable to assist with farming supplies then please consider donating through the Somerset Community Fund Flood Appeal by clicking here. Although it looks like we may have seen the worst of the weather, the water is still with us and looks like it could be staying for many more weeks. The short term damage is clear to see but most worrying is what is left under the water. It will be a long project to revive these lost communities and you giving your support will be needed if we are to have any hope of restoring these farms and villages to they former glory, so for now we would like to say Thank You! Here is the tweet we sent earlier, please retweet to carry on this work.